Fences are prone to rusting and rotting. Your fence is constantly exposed to changing weather and harsh elements such as heat, wind and water. But, there’s a way to slow down the rotting and rusting in fences. This technique is known as staining. Staining waterproofs the fence and protects the surface from damages brought about by external elements. It can prevent rotting and rusting in both wooden and iron fences. Fence staining in Frisco TX usually involves using paint, anti-rust solution and/or pest control solutions. Before fence staining, it is recommended that the fence be cleaned by a power washing. Power washing, also called pressure washing, cleans away molds, dirt, old stains, rust, mud, peeling paint and other materials found on the surface of the fence. Power washing ensures that the fence stain will last longer. Never use cleaning products such as bleach, brushes, or rollers in preparing the fence for staining. Use of brushes or rollers in staining the fence should also be avoided. When staining a fence, it’s best to hire an experienced and professional fence contractor who knows how to do fence staining in Frisco TX. They have the knowledge, the right equipment, and the skills in staining a fence properly. If you hire a fence contractor, the stain should last longer and be of higher quality. When considering which fence contractor to hire for fence staining, you should follow the same advice we provide on how to select a good fence company in Frisco TX; And, you should also find out if they specialize in fence staining. 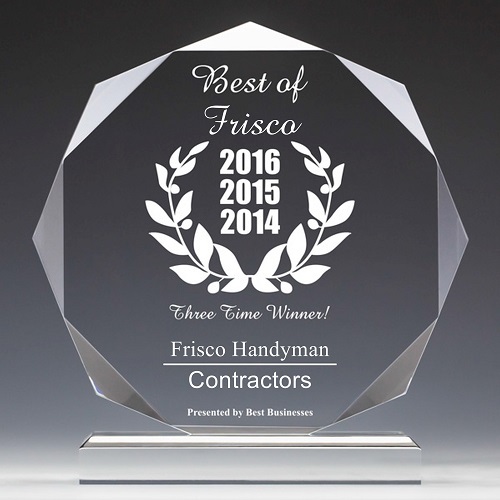 The companies that specialize in fence staining in Frisco TX typically work faster and they can often finish staining the fence within a day. Hiring a professional to stain the fence may also be able to help you to save money in the long run. You won’t have to worry about buying the materials yourself, buying the wrong materials, or be concerned about making mistakes in staining the fence – which would require you to re-stain the fence and end up costing you more money. And, you would not have to be overly concerned about missing a portion of your fence because a company specializing in fence staining will ensure that the crevices and every nook of the fence is properly stained. Fence staining is vitally important. That’s why it’s best to work with a professional to make sure that it will last longer and protect the fence from rotting and rusting. But, you should be aware that it is not a one-time process. The staining should last approximately two to five years and will need to be re-stained several times throughout the lifespan of your fence.